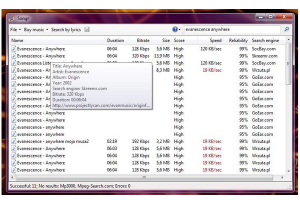 "Portable tool for searching multiple MP3 search engines at once"
So, if you're looking for a utility to help you in your search for qualitative MP3 music you might be interested in the free product presented here, called Songr Portable. Elsewhere on Winportal we presented the free product called Songr, and here we present its portable version which offers exactly the same functionality, with the aggregated value of being portable. As such, you might consider including it on your portable USB flash drive to have this MP3 multi-search functionality available anywhere you would like to use it. With Songr Portable you'll be able to search 16 dedicated MP3 search engines at once, download YouTube videos and even extract the audio as MP3. Proceed to the download if interested in this utility.